Someone's making Big Wheels for adults. Everything is awesome now. I don't know if it was God or Satan or some other cosmic entity, but someone finally heard my prayers because High roller USA is finally, finally bringing back the joy of Big Wheels to those who can appreciate it most — adults. I have to assume that everyone who knows what a Big Wheel is is currently frothing at the mouth in pure ecstasy at this news, so to the rest of you: Big Wheels were the ultimate mode of transportation for kids of the late '70s and beyond. A completely plastic tricycle with the coolness of the motorcycle, Big Wheels could reach blistering speeds of up to 5 mph (depending on how fast your little legs could work the petals) and often had awesome theme like Batman or The Dukes of Hazzard. I personally destroyed several sets of my Big Wheel's plastic tires in my youth, but I had a need for speed (and I kept pulling the emergency handbrake on the side for awesome spin-outs). High Roller USA's adult version costs $600, but has a steel frame, alloy rims, can carry passengers up to 275 lbs. and had sweet tassles on the handlebars.The wheels are still plastic, but some denser space-age polyethylene version that are supposed to last 150 miles. The handbrake is missing, but the there is a handlebar brake. 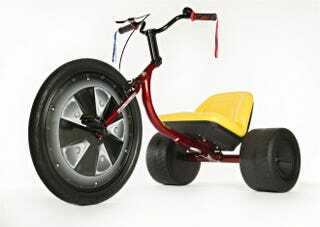 You can order your High Roller Adult Size Big Wheel Trikes here. And you should. I'm going to order mine in a bit, because it turns out I owe some divine being a snow-white bull or two first.